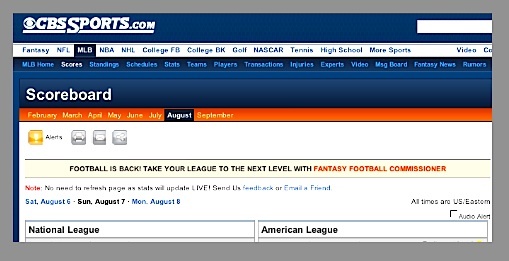 The root cause is the fact that Major league baseball has a LONG season. Over 160 games are played every year, not including the post season if you're lucky to make it that far. Playing 160+ games - roughly half of which are played on the road - is a GRIND. By the time September rolls around, everybody's tired. Physically AND mentally. These guys enjoy an extraordinary standard of living but at the end of the day they're human beings. Everything that affects us day in and day out affects them too. A big difference between us and them is, these guys have to juggle life under the microscope. Bad days with the good ones. This is not easy. Many people might be surprised to learn that playing Major League Baseball is a lot harder than it looks, as are the pressures that are on these players. Statistically, the odds of repeating as World Series champs are very low; even if you're a great team on paper. It hasn't happened very often. Yet many people believed The Phillies were the better team and were going to win it again. I think to a man, The Phillies believed this too. It was in their heads. But this kind of belief can be a double-edged sword... it can instill a sense of premature relaxation... that things will "go our way" no matter what. And this can take the edge off a team's collective attitude if they're not hungry enough for success. I think The Yankees had something to prove this year; they had a much bigger monkey on their back than the Phillies did, and they seemed more motivated to shake that monkey off. The Yankees had suffered a number of post-season collapses in the last decade and these collapses were very much in their minds. The pressure on them to win was tremendous. In my view The Phillies were still riding the wave of being World Champions, and that sheen hadn't worn off. Who was hungrier for the win? Perhaps the Yankees were this year. 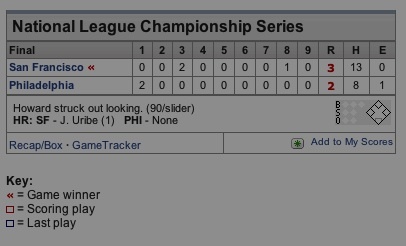 I think The Phils worked hard to beat The Dodgers. They were very much focused on that team, having faced them last year in the same playoff and they were determined to show THEY were still the best team in the NL. They wanted that bad. And they did it! I think that they peaked in the Dodgers series; they put it all together on the field, with pitching and hitting and it looked easy. Unfortunately - and I don't think they realized it - that playoff victory emptied their emotional AND physical tank. After The Dodgers, The Yankees were a letdown for them. The Phils assumed they would take them. But they played flat. The wind was out of their sails. An incredibly simple reality of being human beings .... where you just can't muster up the same fire, the intensity, or the will that you had just one week ago! How can you play so strong one week, then just one week later play like a totally different team when nothing much has changed? Because you're tired. Because you're worn out, mentally and physically, and you just can't get it up again... no matter how much trash you talk or how hard you swagger. Because you're human. And you're done. Even if your team is the better team. In my mind, The Phils simply ran out of gas one week too soon. That's all. It's a shame for The Phillies; two World Series victories in a row would have been unprecidented glory for the franchise, and the city, and they all understood that ... but they couldn't will themselves to play like the superior team this time. The Yankees could, and I believe that's why they won instead. Going down to Citizens Bank Park tomorrow evening ... taking my sweetie and two neighbors ... gonna enjoy the sold out crowd, the vibe, the way-overpriced beers and the nice 100-level seats along the third base side ... oh yeah. And hopefully watch our Philles beat the Cardinals! Forecast for the game ... around 72 degrees at 7:05pm (gametime) with a slight chance of a roving thundershower ... but no matter. Works for me! If it dares to rain we'll stroll up to to the concessions level, grab some food and overpriced beers and watch the rain fall. And jeez, where did that guys' pants come from? They better arrest them too! Or would they need to hire the ball park fashion police for that? The game I attended was the one in which the second doofus ran out on the field! "TASER! TASER! TASER! TASER!" It was hilarious! There's certainly no shortage of dimwitted losers out there! Thats it.... with the tying and winning runs left on base. as The SF Giants celebrate their win, as they now head to the World Series. 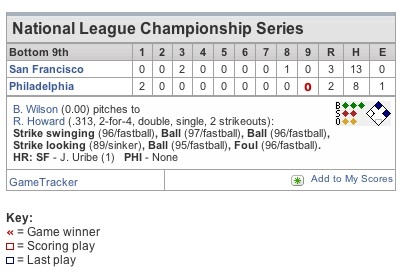 Congratulations to The SF Giants. this SoulfulPlanet Phillies Thread will keep going, too! C'mon SPRING, SUMMER & all the good stuff that goes with it! TAMPA, Fla. � Move over Red Sox-Yankees, there�s a new rivalry brewing in baseball. The Washington Nationals are tired of Phillies fans taking over their ballpark, so they�re trying to ban those red-clad rowdies from purchasing tickets for the first series between the teams in May. Washington "Zip, Ban & Delete" is now hitting spring baseball, too? Are you kidding me Geno???? What a fricking wimpy way to behave! DC is only allowing THEIR fans to buy tickets?????? They should be ashamed of themselves!!!! Why would ANY team agree to play in DC's ballpark? 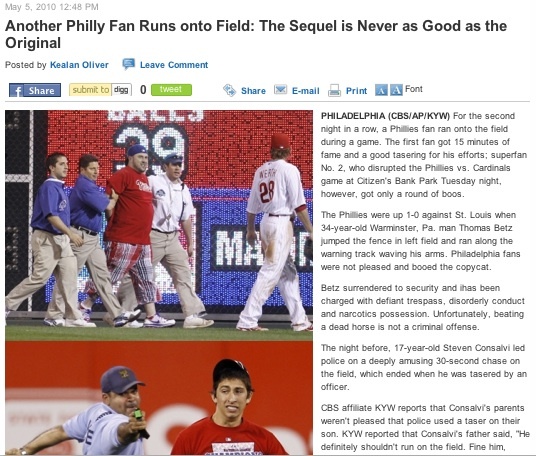 If DC wants to control their ballpark so much, and they're boohooing about too many Philly fans showing up, maybe the Phillies should tell them to go ahead and keep their ballpark pristine and they can invite their proprietary crowd to watch their team play with themselves.